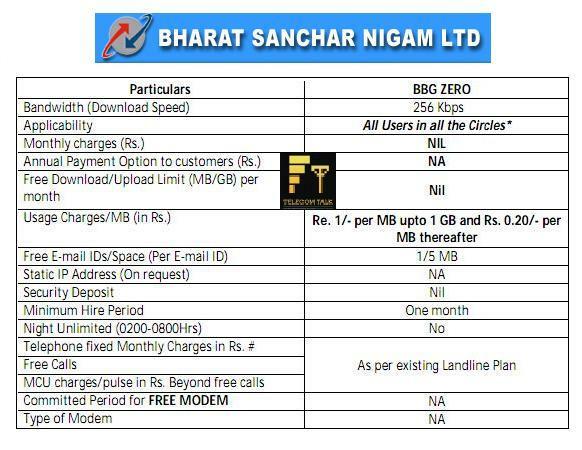 In a bid to empower each and every one in India with High Speed Broadband Internet connectivity at affordable rates, Bharat Sanchar Nigam Limited (BSNL), country’s largest Broadband service provider comes with promotional Zero Rental BB Plan with 256 Kbps Speed. Few years back the same plan was launched by another PSU MTNL in Mumbai telecom circle. Now subscriber of BSNL Landline can clubbed/subscribe the new Zero Broadband Plan (BBG ZERO) just by making the request at their nearest CSC. The Data download charges will be Rs. 1 per MB till 1 GB and 20 paisa /MB thereafter. The existing BSNL Broadband customers in any plan can also migrate to this plan but it will be valid for 6 months only or till the availability of Plan.The promotional offer will be available in all telecom circles across India up to 31st March 2011. Note : The Circle CGMs are authorized to implement this plan only in those cities of the respective Circles, where port capacity is not a constraint and other plans will not be affected by its launch. At present I have BB 499/- unlimited plan. I would like to migrate to Zero Rental BB plan as I shall be out of station for quite some time. Upon enquiring with Nasik Telecom office it is informed that this plan is not available in Nasik. Kindly confirm soonest as I am going out of station in next few days.